How Does Profit Variance (Gross Profit) Analysis Work? Profit, whether it is “gross profit” or “contribution margin”, is affected by at least three basic items: sales price, sales volume, and costs. In addition, in a multi product firm, if not all products are equally profitable, profit is affected by the mix of products sold. Changes in unit sales price and cost, called “sales price” and “cost price variances“, respectively. The difference between sales price variance and cost price variance is often called a “contribution-margin-per-unit variance” or a “gross-profit-per-unit variance“, depending on what type of costing system is being referred to—that is, absorption costing or direct costing. Contribution margin, however, is considered a better measure of product profitability because it deducts from sales revenue only the variable costs that are controllable in terms of fixing responsibility. Gross profit does not reflect cost-volume-profit relationships. Nor does it consider directly traceable marketing costs. 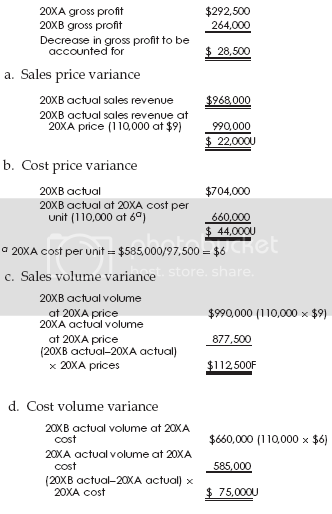 Changes in the volume of products sold summarized as the “sales volume variance“ and the “cost volume variance“. The difference between the two is called the “total volume variance“. Changes in the volume of the more profitable or less profitable items referred to as the “sales mix variance“. Detailed analysis is critical to management when multi products exist. The volume variances may be used to measure a change in volume (while holding the mix constant), and the mix may be employed to evaluate the effect of a change in sales mix (while holding the quantity constant). This type of variance analysis is useful when the products are substituted for each other or when the products that are not necessarily substitutes for each other are marketed through the same channel. Now, let’s go for further details…. To determine the various causes for a favorable variance (an increase) or an unfavorable variance (a decrease) in profit, we need some kind of yardstick to compare against the actual results. The yardstick may be based on the prices and costs of the previous year, or any year selected as the base period. Some companies summarize profit variance analysis data in their annual report by showing departures from the previous year’s reported income. However, one can establish a more effective control and budgetary method rather than the previous year’s data. Standard or budgeted mix can be determined using such sophisticated techniques as linear and goal programming. How To Calculate Profit Variances For Single-Product Firms? Profit variance analysis is simplest in a single-product firm, for there is only one sales price, one set of costs (or cost price), and a unitary sales volume. An unfavorable profit variance can be broken down into four components: a sales price variance, a cost price variance, a sales volume variance, and a cost volume variance. If the actual unit cost is lower than budgeted cost, for example, this variance is favorable; it tends to increase profit. We simplify the computation of price variances by taking the sales price variance less the cost price variance and call it the gross-profit-per-unit variance or contribution-margin-per-unit variance. The difference between the sales volume variance and the cost volume variance is called the “total volume variance“. How To Calculate Variances For Multi Product Firms? When a firm produces more than one product, there is a fourth component of the profit variance. This is the sales mix variance, the effect on profit of selling a different proportionate mix of products than that which has been budgeted. This variance arises when different products have different contribution margins. In a multi product firm, actual sales volume can differ from that budgeted in two ways. The total number of units sold could differ from the target aggregate sales. In addition, the mix of the products actually sold may not be proportionate to the target mix. Each of these two different types of changes in volume is reflected in a separate variance. The controller of the Royalla Publishing Company prepared the following comparative statement of operations for 20XA and 20XB. e. Total volume variance (sales volume variance ? 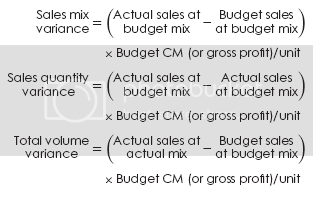 cost volume variance) or (sales mix variance + sales quantity variance). f. Sales mix variance = 0 since we have only one product in this problem.